With his win yesterday, James moves onto Page #1 of our ToC Tracker. A win today will likely clinch a spot in the next Tournament of Champions for him. Online testing continues today! You can find yesterday’s questions here! Correct response: What is Romanov? The Romanovs were the last imperial family of Russia, consisting of Tsar Nicholas II, his wife Tsarina Alexandra, and their five children Olga, Tatiana, Maria, Anastasia, and Alexei. They had been killed in the Russian Revolution of 1918 and were deemed martyrs by the church, though not without controversy, as some felt that it was the ineffective rule of Nicholas II that had brought the revolution in the first place. An average of 2.7911 5+-time champions (standard deviation 1.5793). An average of 4.3563 4+-time champions (standard deviation 2.2282). An early cutoff took place 3.736% of the time (or a 5-game winner will be left out). Eric R. Backes qualified 85.191% of the time. Anneke Garcia qualified 64.377% of the time. Lindsey Shultz qualified 27.982% of the time. Dave Leffler qualified 3.449% of the time. Jonathan Dinerstein qualified 0.584% of the time. 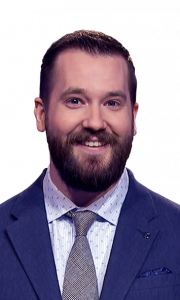 With $298,687, James passes Seth Wilson and Arthur Chu on the regular play winnings list and moves to #6 all time in regular play winnings, and to #23 in all-time winnings. 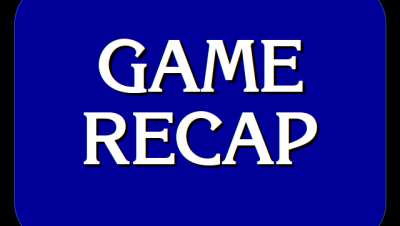 James was going for November 22 in his 11/22 on his Final Jeopardy! bet. The record for “most correct responses in a player’s first five games” is at least 165; however, there are players who may hold that record whose entire runs are not in J! Archive. 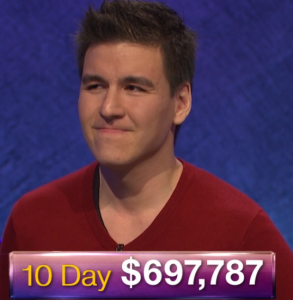 20 Comments on "Today’s Final Jeopardy – April 10, 2019"
Isn’t Jonathan out (as soon as we have the new TT winner)? We have Dhruv, the new TT winner as # 1 @2, then 13 “regular” players, currently Josh Hill through Dave Leffler for a total of 15. Jonathan would be the 16th…? Unless they do the ToC before the TT Jonathan is out, no? Sean: the model takes that into account. Jonathan isn’t technically out until James loses, that percentage indicates the chance that James keeps winning for the duration of the model. Got it. James might still be playing when the next ToC is taped. Then he would be in the one AFTER the next…. James is quite something. The FJs this week were rather easy though, today probably the easiest of the 3 so far. Still, WOW! Knowledge is one thing, but he’s also quick on the buzzer. 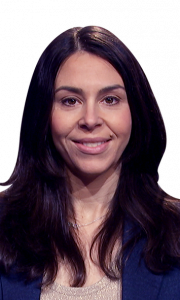 Plus he likes to employ the champion’s advantage, going from top to bottom on the categories and moving around the board to throw off the rhythm of the newcomers. Jeff today just got swamped by James’ speed, which only amplifies the notion that if you are able to buzz in first against him, you better be right. Sorry that the clues were mean to Jeff. On today’s game your question about the battle at Hampton Rhodes was not between the Monitor and the Merrimack. It was between the Monitor and the CSS Virginia. The Merrimack was a ship that had burnt to the waterline and the lower portion of the hull was used to build the Virginia. Your researchers need to be more careful. 1) This is a fan site with no ties to the show or contact with the show. I did the worst ever on the Jeopardy! online test yesterday. 25 out of 50 (I have my son video my test and I go back and check each answer. 2 years ago I made it to second round but never made it on. I would get KICKED by James. 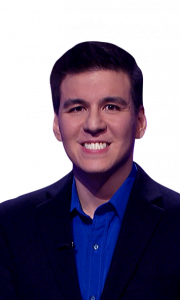 I have to say that watching James has been way more fun to watch than even Ken Jennings run years ago. I love his “go for it” betting strategies in the double Jeopardy! questions. When Ken Jennings was on I used to record them on VCR with a timed recording! Sure is nice having a DVR now. Since you brought up the Maple Leafs a few weeks ago and their lack of success in the NHL playoffs, here’s to a successful run this season! You might guess by my screen name that I’m a hockey fan. The way I see it, the Leafs can score with the best of them, but (as I’m sure you know) it’s defense that is so important in the postseason. The Bruins have a very good team, but one interesting statistic is that Tuukka Rask is the worst-rated goalie in the NHL with an 88 save percentage since March 1. If the Leafs can take advantage of that and take the lead early in each game, they have a chance. Many Boston fans are taking this series lightly and looking ahead to the second round — in fact, some are saying they’re in store for a “grand slam” (all four pro championships won by Boston teams in a single year). The Leafs can take care of that notion starting tomorrow. I don’t get it. Each day you were either right or wrong? by 50-50, I think she means that she was right 50% of the time and wrong 50% of the time. James has won 5 games, he’d need to do this 13!!! more times to still be shy of Ken’s record run. He’s fun to watch and I’m not saying Ken’s record will never be broken, but I don’t think it will be broken by someone with his style of play…too high risk. The “all in” daily double will do him in before we get to another 65+!!! games. To be fair, I think James knows exactly his positions in the games. His all-in bets tend to come early enough that he expects his buzzer speed can bail him out if he’s wrong (which basically happened today). I think we’ve seen that once he builds a big enough lead, he eases up on his bets, relatively. He still makes big wagers on the Daily Doubles but that’s just a factor of his lead. 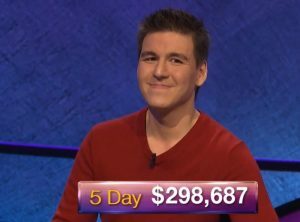 Like, his $25,000 bet yesterday was record-setting, but he knew it was near the upper limit of what he could bet while still maintaining a lock game. Still, I agree that the odds of maintaining his pace for another 70 games are really against him, as they would be anybody, just because of how many variables in the game there are. People get tired taping 5 games a day and that plays into it as well. Good point about the timing of the all-in bets. I agree the Ken record is almost untouchable…too many variables is right. The game has changed too much since 2004. Questions are written differently, and challengers used to only get buzzer practice until they got in first 2 or 3 times. Now they get most of a board. My prediction model currently has the chances of James breaking Ken’s wins record at about 4.35%. Andy, can you further elucidate us on your comment about buzzer practice and your feelings about how the answers/questions have evolved since 2004? Thanks.